The chin is important in maintaining facial balance. A small chin can lead to a weak appearance and make the nose look larger than it is. Chin augmentation can restore facial harmony and balance and will give a more defined look and enhance the shape of the face. In chin augmentation surgery, a small incision is made below the chin in a convenient skin crease or inside the mouth. Next a pocket is dissected just in front of the recessed bone in order to accommodate a specialized silicone chin implant. Depending on the dimensions of the chin that need to be improved, the implant selected may be varied in height, width, and projection to produce the desired effect. 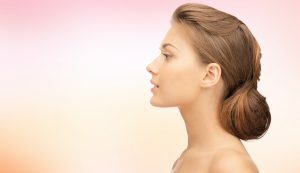 Chin augmentation is commonly performed in conjunction with rhinoplasty.